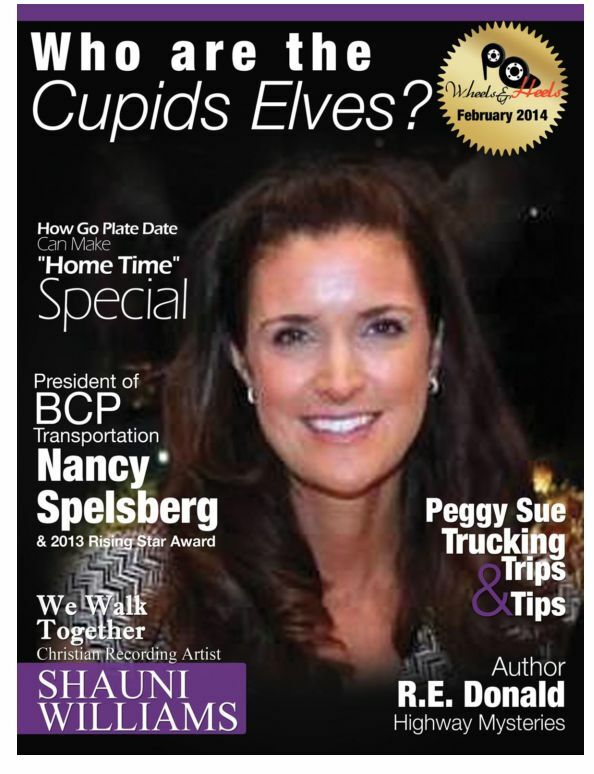 I am honored and delighted to be featured in the February 2014 issue of 18 Wheels & Heels, a magazine for women in the trucking industry. They first contacted me on Twitter (@RuthEDonald) to ask whether I would be interested in having them feature me and my Highway Mysteries series, and of course I replied with an enthusiastic Yes! They’ve listed my three mysteries in their “Book It List” of good reads for their subscribers as well. The role that women play in the trucking industry has obviously continued to evolve since the time period that the Highway Mysteries are set in (the 1990s). Most of us have seen a few hot pink or purple trucks on the road, with the drivers joyfully flaunting their femininity. Others downplay their gender in order to avoid harassment by their male counterparts; gender discrimination can still be a problem for women in the male-dominated industry. There are a few books out by women truck drivers chronicling their years in the industry, among them Trucking in English by Carolyn Steele. I liked reading about her adventures, and could relate to much of what she experienced. I enjoyed my years working in the transportation industry, and am happy that I can put my experience to good use in the Highway Mysteries series. I’m also glad to have endorsements from readers who work in the industry, as I try very hard to make sure my settings and situations are authentic. Last year, two of my books were also reviewed and described as “recommended reads” by a trucking publication in the United Kingdom, Truck and Driver magazine. (The books were Ice on the Grapevine and Slow Curve on the Coquihalla.) I was delighted to hear from some new fans in England who had purchased my books on their recommendation. The central plot of each novel is, of course, a murder mystery, but my stories are driven by the characters in them. Those characters are real to me, and you can meet people like them working in service industries (including trucking and law enforcement) almost everywhere in North America. They have flaws, insecurities, hopes and dreams; they have fears and triumphs, loves and losses, foibles and indulgences. They are ordinary people, and like all “ordinary” people, they are unique. They are my friends, and I hope they will become your friends, too. Tags: 18 wheels, crime, kindle, kobo, murder mystery, mystery, mystery series, RCMP, truck, women in trucking, writer | Permalink.